As you are already aware, our community has serious concerns with regards how the Council intend to replace existing sporting facilities that will be lost as a result of the KALC project. It appears that there will be a net loss in terms of five a side pitches that has not been satisfactorily resolved by the Council’s planners. There are also concerns that the pitches the Council are providing as part of re-provision are not fit for purpose as they are located right next to a motorway and are subject to flooding any time there is any significant rain. This is not acceptable to our community! It was very kind of you to take the time to visit Lancaster West Estate last year to witness yourself the way the sporting young of our community are being treated by those in power at Kensington and Chelsea and we hope that Sport England will robustly ensure that the Council’s statutory obligations with regards sporting provision are rigidly followed during the planning process and beyond. Please do not hesitate to contact us if you require any further information or if you would like us to arrange another visit to Lancaster West Estate? In the meantime, thank you for your continuing support with regards protecting our community’s sporting aspirations. The Lancaster West sports pitches are well used, and are used most days by school parties from far and near. These will all have to go to the Westway Centre in future if they want to play outdoor sports. Even the new academy on the Lancaster Green site will have no outdoor sports facilities, except for a single rooftop multi-use games area (muga) about as big as a tennis court. We have been told this will be available for use by the community, but this will only be outside of school hours, and will of course be for a price. The kids of Lancaster West are used to playing football for free on the existing pitches. They certainly can’t afford to pay through the nose every time they want to have a kickabout, and there is nowhere else on the whole Lancaster West Estate where they can have a kickabout. 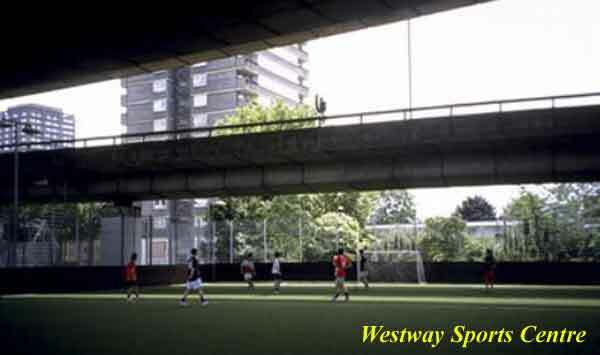 In July 2010 Cabinet voted £75,000 to fund re-provision of the Lancaster West playing pitches at Westway Sports Centre. We have no reason to doubt that this money was paid to Westway Development Trust and used to convert two tennis courts at Westway to dual use. The courts in question were re-surfaced, and provided with removable five-a-side goalposts, but surely it wouldn’t cost £75,000 to resurface two tennis courts? Did RBKC really pay the Westway Trust £75, 000 for this work, and if so…..
Where’s the rest of the money? In any case, this alleged ‘reprovision’ actually results in a net loss of sporting facilities locally, as the Lancaster West facility will be lost with no additional capacity gained at Westway, so how can it truthfully be called reprovision? This is re-provision in name only, and is just another part of the BIG CON being perpetrated by the KALC plannners. 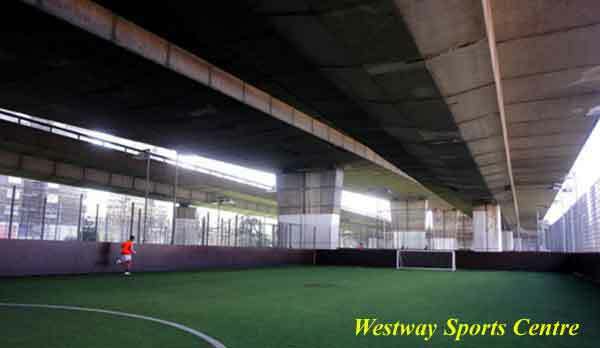 Westway Sports Centre is a massive complex, most of which which is almost subterranean, beneath a spaghetti junction of motorway ramps. Strangely they do not test air quality on the site. The nearest roadside testing stations are half a mile up the road at Ladbroke Grove Library, which is a stone’s throw from the westway flyover, and half a mile the other way in Hammersmith and Fulham. Both of these stations record high levels of nitrogen dioxide and particulates, both of which are implicated in the massive asthma epidemic of recent years. Children of school age are, of course, disproportionately affected by this condition. “In 2000, the whole borough was declared an Air Quality Management Area on the basis that certain government air quality objectives, for nitrogen dioxide and particulate matter, would not be met”. We strongly suspect, and there is good reason to suspect, that air quality in the vicinity of the Westway Sports Centre is as bad as at any of the Borough’s worst blackspots. So, apart from the obvious criticisms of this so-called re-provision that is not really a re-provision, on a site that is too close for comfort to motorway ramps, and that floods every time it rains, we are just a wee bit curious as to why RBKC considers it appropriate to concentrate so much of the outdoor sports provision for North Kensington in what is effectively a Minotaur’s Lair, and why no-one seems particularly bothered about the air quality at this site, given the fact that it sits underneath one of the busiest motorway flyovers in the country.